TouchPad Text Editor is a text editing application made for the HP TouchPad. You can create new text files, edit old ones, remove old files, and even create new directories in your system. Features search and replace functionality, spell-check, auto-capitalization and auto-correct options. Multitasking is done using tabs which increases your productivity as you can work on many files at the same time. Features both Windows and Linux/Mac line endings so your text files are compatible with the desired Operating System. You can even email your files using this application. Editing text files on your TouchPad has never been easier. Do not update from Preware to version 1.0.5. Remove the app and then install the 1.0.5 version. If you like this app please consider supporting Manas Coding by downloading the full version in the Official HP Catalog. It's only $0.99USD and contains additional features. The full version contains a web-browser in which you can view either any site on the web or the current file you are writting. 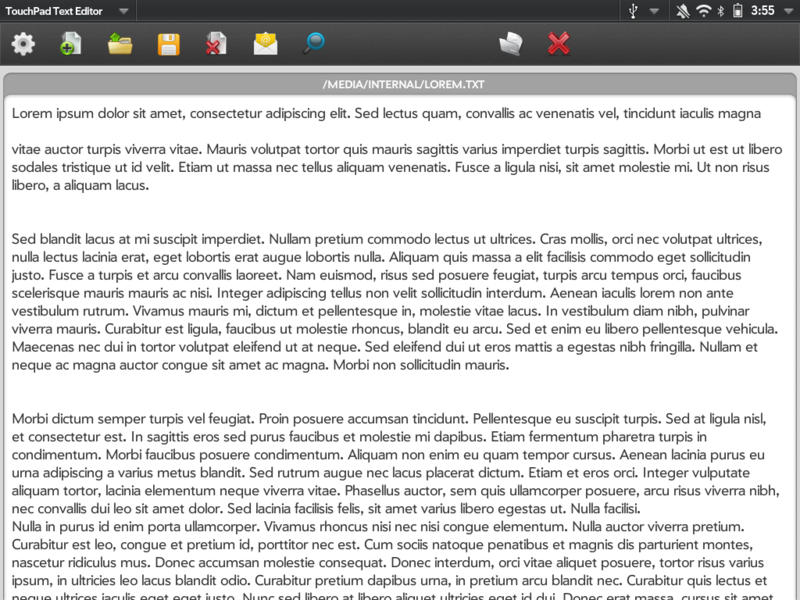 This makes TouchPad Text Editor perfect for writting HTML files as you can test them right away. If you are updating to the full versions from either version 1.0.1 or version 1.0.2 you will need to uninstall first then install the paid version. Otherwise you will get a download failed error. Version 1.0.1: Improved the search fuctionality and escaped characters. Version 1.0.2: Made it clear where to type to save the file. Version 1.0.5: Improved the search/replace functionality. Added help. Made couply of improvements that were suggested by the community. Changed name to TouchPad Text Editor Basic.